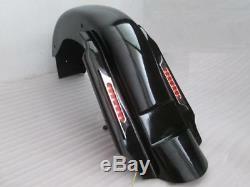 4 REPLACEMENT SUMMIT REAR FENDER HARLEY TOURING ROAD KING STREET GLIDE 93-08. It is required to sand down and repaint IN ANY CASE. 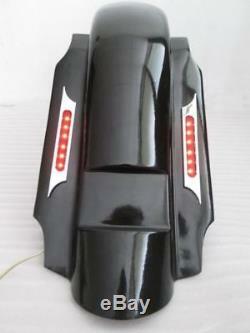 We specialized in hand made fiberglass part. 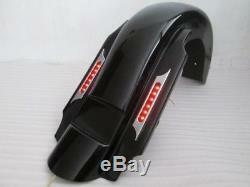 You are looking at an awesome brand new fiberglass 4 stretched cover fender (WITH AWESOME LIGHTS). It will fit your TOURING. This fender features a recessed license plate mount. The fender comes in black finish. We put extra care into our finishes. Our fenders are tough and made with heavy duty material. Our products are very smooth and require little prep work. Please consult a professional for best results on painting and installation. This is an amazing product at an even better price. 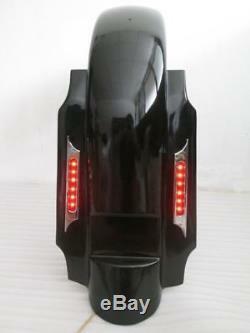 It is available for dual exhaust as will in our store. Feel free to contact me with any questions. EVERYTHING INCLUDED ON MY PROFILE PICTURES IS WHAT YOU WILL GET. COVER/REPLACEMENT FENDER WITH DUAL CUT-OUTS. 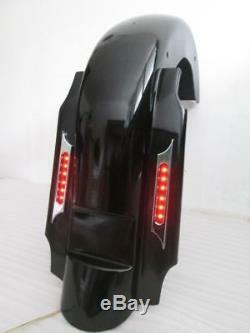 New fiberglass stretched cover fender for TOURING. 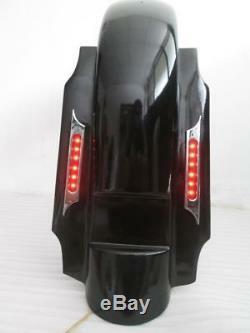 ROAD KING STREET GLIDE 93-08. · Comes in a black finish. 100% hand laid fiberglass construction - lighter and much stronger than plastic. 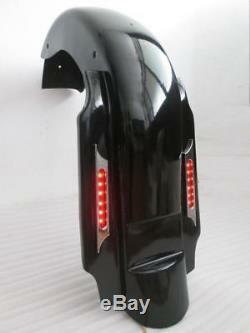 Includes stretched fender with exhaust cutouts. IF YOUR BIKE HASN'T BEEN ON LISTING OR YOU HAVE ANY QUESTION , PLEASE ASK!!!!!! WHAT YOU SEE IN THE PICTURES ARE WHAT YOU WILL GET. IF YOU DONT KNOW HOW TO INSTALL, PLEASE SEEK FOR PROFESSIONALS.